A complete change of gears from Guardians, I was responsible for developing and designing a great deal of the creatures and characters you will see in the CROODS. 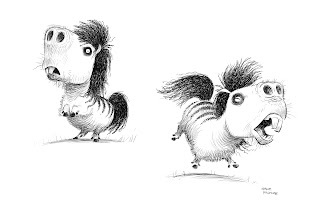 Myself and Shannon Tindle were the first artists on the project back when Chris Sanders started at Dreamworks in 2007(before Dragons). After a quick detour onto Dragons Carter Goodrich, and Takao Noguchi joined the design team. 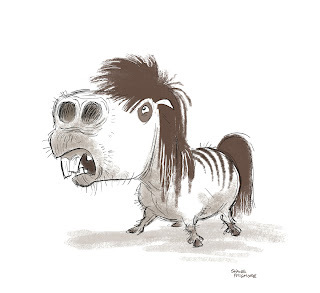 Over the next few weeks I will show much of my development work from Croods, but I will start with one character that you will not actually see in the final film. 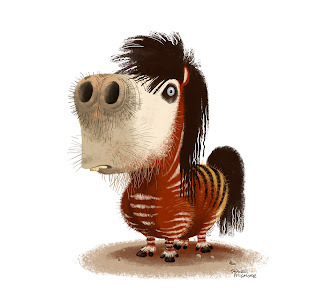 This is a little prehistoric proto-pony that was at one time Guy's pet. She actually made it as far as an early Croods teaser poster, but in the 11th hour Belt became his pet and the pony was changed into the little reptilian guy you will see in the final film. Stay posted for much more, and enjoy. Amazing work! I can't wait to see more! Shane, you draw moderately well. Hooray. Very nice! What made it be replaced by the reptile? Thanks for stopping by everyone. And thanks for the kind words. I didn't know you were in the blogosphere now! HOORAY for everyone! Thanks, and as you will see when I start posting more, we were always pushing to create more unique creatures for this world. 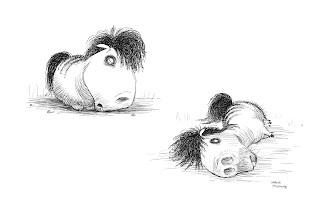 Also this little pony started to become to much of a"cute" character, when what the directors finally wanted was a more comedic side character. Lots of factors, but some of the spirit of this pony found its way into the new little guy. hahah love this guy, cant wait to see more! i like it very much you want to know it is very good but i have some question reply me i will ask you? A Very Special Coloring Book at CTN EXPO !